Ed [Cosens, Reverend and the Makers’ guitarist and songwriter] and I became resolute to make a record that we loved. Why not indulge the overwhelming urge to not play games anymore and set about making some art we are actually proud of rather than the release-tour-festivals-repeat cycle we’d been on since forever? And so we took the files we’d been diligently recording off to Jamaica and spruced them up a bit whilst making a film. The result is the best thing we’ve ever done in my opinion. The reaction when I play it to people is like nothing I’ve seen before, except maybe the first album. McClure’s ever-erudite lyrical style and the band’s prominent rhythmic foundation are the two constants on ‘Mirrors’, and probably the only stylistic carryovers from previous album ‘Thiry Two’. The edgy dance vibe is gone, replaced by a sultry Jamaican-influenced soundscape of minor key harmonies, colored with gritty blues guitars over vibrant brass and strings. The songs themselves are a bit all over the shop, representing a pastiche of different styles and moods tenuously strung together by a general tone of muted West Coast psychedelia. In the opening sequence to ‘Mirrors’, the hypnotic prelude ‘Amsterdam’ segues into the tribal percussion and groovy electric bass of the dark early single ‘Black Widow’. The psychedelic flower child vibe of ‘Makin’ Babies’ is a welcome ray of sunshine, dampened only slightly by ‘Stuck on You’, which is perhaps more ironic than actually grateful. ‘The Beach and the Sea’ is a slow, dreamy interlude in the middle of the album, its two lyrical lines expounded upon by a lush instrumental setting of lilting backing vocals and a delicate piano motif that reflects like glints of sunshine on sand. The second line “I’ll be the branches, while you be the breeze / bend and shape me any way you please” seems to come from a distance, muted amid the reverberant bass almost as if being heard from underwater. The album takes a slightly more aggressive tone after this point, with a brief but intense psych rock jaunt in ‘The Trip’ and an instrumental journey into Latin territory with the serpentine rhythm of ‘El Cabrera’. ‘Blue’, appropriately enough, is a lyrically simplistic experiment with blues stylings, while ‘Something to Remember’ dips back into the psychedelic haze with melancholic poetry and moody vocal harmonies to suit. ‘Mr Glasshalfempty’ and ‘The Gun’ might best be described as character pieces, the former both darkly ominous and sarcastically upbeat, while the latter takes on a tongue-in-cheek march tempo and heavy brass orchestration in describing the life of a hired hitman. In one of several vocal appearances by band members other than Reverend Jon, Laura McClure takes the lead vocal on the dramatic ‘My Mirror’. Her drawn out vocal lines stretch over a chugging rhythm that eventually loses momentum and fades out to ambient, distorted sound. The minor key harmonies and bowed strings keep the acoustic ballad ‘Last to Know’ from being completely out in left field, between ‘My Mirror’ and the slow, hypnotic tempo of ‘Lay Me Down’, which also fades away after a lengthy instrumental coda. None of the songs on ‘Mirrors’ are overly prolonged or self-indulgent, which probably indicates the newfound freedom and independence of the album’s recording process. Its 14 tracks fit into a concise 35 minutes, which allows each just enough time to make a strong impact before moving on to the next. With this set of decidedly rock-oriented songs, Reverend and the Makers have once again, in a swift and decisive motion, upended their own image and emerged with something entirely new. Reverend and the Makers’ fifth LP ‘Mirrors’ is out now on Cooking Vinyl. Film clips to accompany the album can be found on the band’s YouTube channel. Reverend and the Makers will play a run of live dates in the UK this November and December; you can find all the details here. Past coverage on Reverend and the Makers here on TGTF is this way. I’m still reeling somewhat to Reverend and the Makers‘ latest revelation that underneath their dance, bass thumping exterior was hidden a bluesy, growly, Richard Hawley-esque group just itching to come out. (If you missed it, have a listen and watch to the video of ‘Black Widow’, posted 3 weeks ago here on TGTF.) Okay, so are you ready for another slap of reality from the Sheffielders? ‘Makin’ Babies’ clocks in at just under 2 minutes, and as exactly as the title sounds, this could have been plucked from the psychedelic ’60s and ’70s, and the lo-fi sound shuffles along nicely. I don’t think it’s supposed to be epousing free love as they did back then, but instead is about how time is marching on and how all of our biological clocks are ticking. Even the Rev’s. Just a personal musing. Watch the video below. 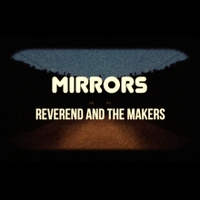 Reverend and the Makers’ next album ‘Mirrors’ is out on the 9th of October; they will be touring in support of the new LP in November and December. For all of TGTF’s coverage on the band (admittedly before they shifted in direction), go here. Reverend and the Makers have announced details of their forthcoming LP ‘Mirrors’ along with a list of UK tour dates for this November. ‘Mirrors’ is set for release on the 9th of October via Cooking Vinyl, and to coincide with the release, singer Jon McClure will also release a book of his lyrics and poetry, called ‘The Lyrics and Poetry of Jon McClure with Illustrations by Horace Panter.’ Watch and listen to the promo for their brand new single ‘Black Widow’ in yesterday’s Video of the Moment. Tickets for Reverend and the Makers’ 12-date UK tour will go on sale Friday the 7th of August at 9 AM. Previous TGTF coverage of the band can be found right back here. Reverend and the Makers have made their name on extremely catchy dance pop bangers. Single ‘The Only One’ from last year’s ‘Thirty-Two’ album is a great example of this. So I’m a little confused but also a lot intrigued by their premiere of their newest song for the world on Steve Lamacq’s show last night on BBC 6 Music. Seeming to have taken a page out of fellow Sheffielder Richard Hawley‘s book, the new single ‘Black Widow’ features prominent down and dirty guitar, and the track lacks any sort of dance floor bounce. In the promo, Jon McClure is on a motorbike and wearing leathers too – huh? – and it’s filmed Instagram style, in a square format. This new direction in sound and look may confuse longtime fans, but I think both will pique the interest of anyone who wouldn’t touch them with a 10-foot pole before. Have a watch of the grainy traveling video of ‘Black Widow’ below. ‘Mirrors’, their new album that is also the title of a film the band will release at the same time, will drop on the 9th of October. Preorder your signed copy of the album from their PledgeMusic page. For past coverage of Reverend and the Makers on TGTF, go here. Reverend and the Makers‘ new album ‘Thirty-Two’, named for ‘the Reverend’ Jon McClure’s current age, will be out on Monday on Cooking Vinyl. To take you into the weekend on a high note, the band have released the below stream so you could have a cheeky listen before the official release. In honour of the occasion, McClure has even provided a hilarious blog to the Huffington Post with such gems as “The album is called ‘Thirty Two’ for a variety of reasons. Firstly I wanted to scupper Adele‘s chances of using the title when she grows up.” Ha! I reviewed ‘The Only One’, a forthcoming single from the album to be out in March, last week, and it’s brilliant. Read my words on it here.